Celestial Object: Any naturally occurring object in the observable universe is called a celestial body. Stars, planets, satellites, comets, etc. are examples of celestial objects. The moon is the only natural satellite of the earth. This is our nearest neighbour in the universe. The moon is at a distance of about 400,000 km from the earth. In terms of size; the earth is 81 times bigger than the moon. There is no atmosphere on the moon. It is full of craters and mountains. Some of the mountains on the moon are as high as the highest mountains on the earth. The moon does not appear similar on different days rather its shape changes every day. The different shapes of the moon are called the phases of moon. New Moon: On the new moon day, no moon is visible in the sky. Waxing Crescent: Within a few days of the new moon day; the moon appears like a crescent. This is called the waxing crescent. 1st Quarter: Within about a week from the new moon day; the moon appears as a semicircle. This is called the 1st quarter moon. Waxing Gibbous: Within about 10 days from the new moon day; the moon appears as a circle with some portion cut off. This is called the waxing gibbous moon. Full Moon: Within about 15 days from the new moon day; the moon appears as a complete circle. This is called the full moon. 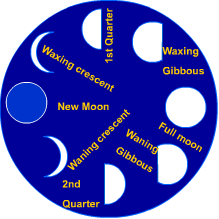 Waning Phase: The waxing phase of the moon is followed by the waning phase. During this phase; the full moon reduces in size and goes through the waning gibbous, 2nd quarter and waning crescent phases. Within about 29 days from the new moon day; the next lunar month begins with the next new moon. Reason for Phases of Moon: The periods of rotation and revolution are same in case of the moon. This means that the moon takes the same time in completing one rotation and one revolution. Due to this, only one surface of the moon is visible from the earth. We also know that the moon does not have its own light rather it reflects the sunlight. So, the sunlit portion of the moon is visible to us. When the moon, the earth and the sun are in a straight line and the earth is between the other two; we are able to see the full moon. On the other hand, when the moon is in between the earth and the sun; we are able to see the new moon, i.e. the whole surface of the moon appears in dark. A star is a huge celestial body. Stars produce heat and light because they are full of very hot gases. The sun is the nearest star from us. It is at a distance of about 150,000,000 (one hundred fifty million) kilometer from us. The next nearest star from us is Alpha Centauri. This is about 40,000,000,000,000 (forty trillion) km from us. Light Year: The interstellar distances or intergalactic distances are too big to be easily expressed in terms of kilometers. Hence, we need a more convenient unit to express them. A light year is the distance travelled by light in one year. Distances of stars are usually expressed in terms of light years. The sunlight takes about 8 minutes to travel from the sun to the earth. This implies that the sun is at a distance of 8 light minute from us. Alpha Centauri is 4.3 light years away from us. Astronomical Unit: The distance between the sun and the earth is called one astronomical unit (AU). This unit of distance makes it easy to express the distance of different planets from the sun. Do you know why the stars are not visible during the day? In fact, the sunlight is so bright during the day that we are unable to see the stars. This is similar to the blinding effect of the headlights of a car. When the headlights of a car fall on your eyes, you are unable to see anything else. All the celestial bodies appear to move from east to west. This happens because the earth rotates from west to east. When you are sitting in a moving train; the objects on the platform appear to be moving in the opposite direction. The same illusion happens to show the apparent movement of celestial bodies. While other stars appear to move with gradual progress of night, the pole star remains fixed at its position. This happens because the pole star is in line with the axis of the earth. The pole star appears in the northern sky. It is only visible from the northern hemisphere. However, the fixed position of the pole star has helped humans since ages. Sailors and travelers used the pole star to find way when they had to travel during night.